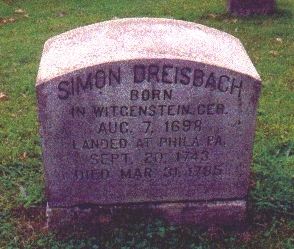 The headstones of Simon Dreisbach Sr. and his wife Maria Catherine, as well as many of their children and descendants, are located at Zions Stone Church, Kreidersville, Allen township, in Northampton County, Pennsylvania. In 1768 Simon's wife, Maria Katharina, died and was buried in the cemetery above her son Jost's house. Simon outlived her by almost seventeen years. Simon Dreisbach lived through the Revolutionary War, but was too old to take an active part. By the time he died in 1785, the church at his son Jost's had been abandoned and a new church had been built a few miles to the south. Here, in the cemetery of recently constructed Zion Stone Church, Simon Sr. was buried. The old cemetery at Jost's was later put under cultivation, and the remaining head-stones were propped against the fence along the field. 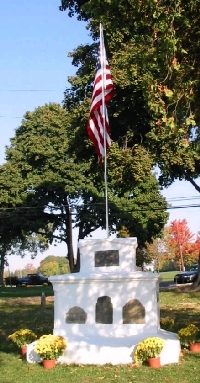 In the 1920's Maria Katharina Dreisbach's grave-marker and a few other surviving stones were moved to the Zion Stone Church cemetery, where they were inserted into a white commemorative monument.